Angela Merkel and other European leaders should act fast to counter Donald Trump’s attempts to encourage the EU’s disintegration. Even before he was elected U.S. president in November 2016, Donald Trump reached out to Nigel Farage, the former leader of the Euroskeptic UK Independence Party (UKIP) who campaigned successfully for Britain to leave the EU. Since Trump’s own victory, he has met Farage, has even suggested he become Britain’s ambassador to Washington, and has lavished praise on Britain’s decision to quit the EU. Trump now plans to meet British Prime Minister Theresa May—though she might have to be second in line if Trump sticks to his intention to first hold talks with Russian President Vladimir Putin. Dempsey is a nonresident senior fellow at Carnegie Europe and editor in chief of Strategic Europe. Trump has not only spent many words praising Brexit and using conciliatory language with Putin. He has also lambasted the EU, asking which country will be the next to leave a bloc that the United States helped create after 1945 as part of a new Western liberal order. That order is now under threat. If only European leaders realized the implications for their security, for their trade, and for their values. Above all, Trump has not hesitated to criticize Germany, its industry, or its leader, Chancellor Angela Merkel—or to air his view that Germany is using the EU as its own vehicle. Now, Merkel is not one to react quickly. But on January 12, on receiving an honorary doctorate in Brussels, she said that “from the point of view of some of our traditional partners – and I am thinking here as well about the transatlantic relations – there is no eternal guarantee for a close cooperation with us Europeans.” Later, she said she intended to sit down with Trump once he was in the White House. On a deeper level, it is not the criticism of Germany that should rankle Germans. It is the way in which the next president of the United States might rekindle old fears of German encirclement, as David Marsh, the managing director of the Official Monetary and Financial Institutions Forum, argued. These fears can be challenged only if Germany and like-minded EU allies do whatever it takes to go for more integration or a two-speed Europe. Despite differences over the years between Berlin and Washington, between Berlin and London, and between Berlin and Paris (a relationship in much need of rejuvenation), this special quartet has kept the transatlantic relationship strong. And despite Britain’s consistent skepticism of the EU, there was never any possibility that the United States and Britain would gang up on Germany. Yet Trump is doing his best to change the dynamics of relationships. In contrast to the outgoing administration of U.S. President Barack Obama, who wanted a strong EU, praised Merkel’s tenacity in dealing with Russia and keeping the EU together, and warned a Britain outside the EU could not expect a quick bilateral trade deal with Washington, Trump is turning everything upside down. Some German politicians say things will change once Trump enters the White House on January 20. His administration, they believe, will understand the value of Europe, the transatlantic relationship, and the pivotal role Germany plays in both. Don’t count on it. Trump represents a new postliberal order that questions the values and the trade, political, and security rules the United States and Europe have built over the years. Since that is the new political outlook, Europe and Germany have to respond. The problem is that the leaders of the EU institutions, including the European Parliament, are in no position to respond to the deep geostrategic changes affecting the West. They are too inward looking and obsessed with power games and turf wars. As for Germany, the lynchpin of Europe’s post-1945 and post–Cold War order, it has one positive choice and one temptation. The positive choice is to pursue Merkel’s agenda for the EU that she spelled out during her honorary doctorate acceptance speech. Her key sentence was about the meaning of Europe. All that Europe has achieved, she said, must be better explained “so that the people understand why we would be much worse off without Europe.” The EU needs someone like Merkel to lead Europe from the top. The temptation is that Merkel’s coalition partners, the Social Democrats, might embrace Trump’s relationship with Putin. German Foreign Minister Frank-Walter Steinmeier, who is poised to become the country’s next president, has often questioned Merkel’s anti-Putin policy and NATO’s deterrence measures in Poland and the Baltic states. The older generation of Social Democrats, who—to say the least—are ambiguous about the United States, long to revive the former special relationship between Berlin and Moscow. So if Trump delivers on his promise to drop the sanctions imposed on Russia for its aggression toward Ukraine in return for reviving disarmament talks, this would be music to the ears of German Social Democrats. Russia’s annexation of Crimea in March 2014 would become a historical footnote. That is why Merkel and other EU leaders from the Nordic countries as well as Ireland, Italy, Portugal, and Spain should act soonest to integrate Europe further and not allow Trump and Brexit sympathizers across the continent to oversee the EU’s disintegration. Trying to find some logical trend in the mind of President Trump is a useless effort. He is compensating his obvious and, sometimes laughable, inferiority to all other leaders with straightforward accusations based on some reality, but often logically disconnected among them and never considered as a whole, to evaluate the consequences of his actions. He knows they are rants, more than policy proposals, but he does not care. In his mind, he was elected to return America to a position of grandstanding, and he knows how to do that: Belittle all the others with any reasonable accusation which can stand, for a while. He will not be able to (mis)manage America for a long time. The check and balance system will impeach him, guided by the most responsible Republicans, since they carry the weight of having nominated him, although he was evidently incompetent. What we should find, instead, are all the reasons why many Americans voted for him. The debate should be opened on these reasons and measures should be proposed and discussed to adjust, at least, all western nations to a more balanced management of our societies, avoiding the election of other leaders as inadequate as Mr Trump. Well said. However till now Merkel has played more of a diplomacist or concillatory-centrist roll between the Putin+SPD cabal and the EU+Washington+London side. For example, on Ukraine and Putin, she has been all half measures. Unless she and Allied strongly ramp up their defense of EU project (and soften till-now German fiscal austerity dictates, opening to more-left pro-EU forces), the odds of her success are slim. The first thing Merkel can do to strengthen Germany is to immediately increase defense expenditures beyond the NATO minimum GDP target. The focus should immediately be on the Luftwaffe, its budget has been significantly reduced since the end of the Cold War in 1989–1990. As of 2014, a significant proportion of Germany's military aircraft were reported to be unserviceable. That would help a great deal. Trump and his team feel the USA has been subsidizing the German social welfare state. A near doubling of spending "overnight" would not be sensible or doable ... it would most likely cause a massive waste of funds and no real capability gain. Besides we're in an election year ... nobody will rock that particular boat in this particular way. Stiftung Wissenschaft und Politik (SWP paper) "Neue Macht, Neue Verantwortung" macht deutlich das Deutschland wieder Machtpolitik betrieben wird. Der EU wird zu diesem Zweck genutzt. 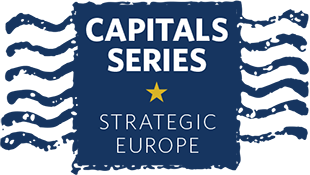 Sign up to receive Judy Dempsey’s Strategic Europe updates in your inbox! Judy Asks: Is Brexit Bad for Europe? Judy Asks: Is China Devouring Europe?